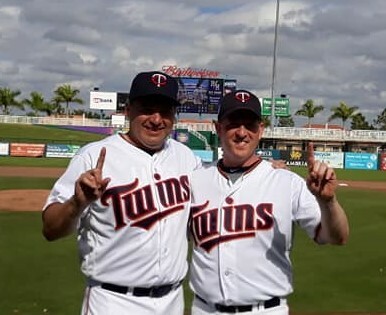 Tales of the (mis)adventures of playing some baseball in Fort Myers, FL while pretending to be a real ballplayer in a Minnesota Twins uniform. 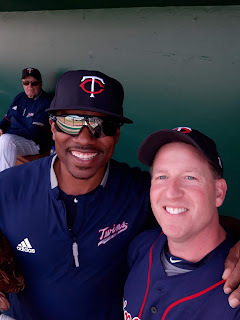 The final post of the 2019 camp is here - so I got through another week basically injury free, legs were really feeling it walking up the jetway from the plane but otherwise was able to get through Sunday after getting on the 7am flight back home to Minneapolis. You can click through the game a bit, maybe just watch the 7th inning if anything! 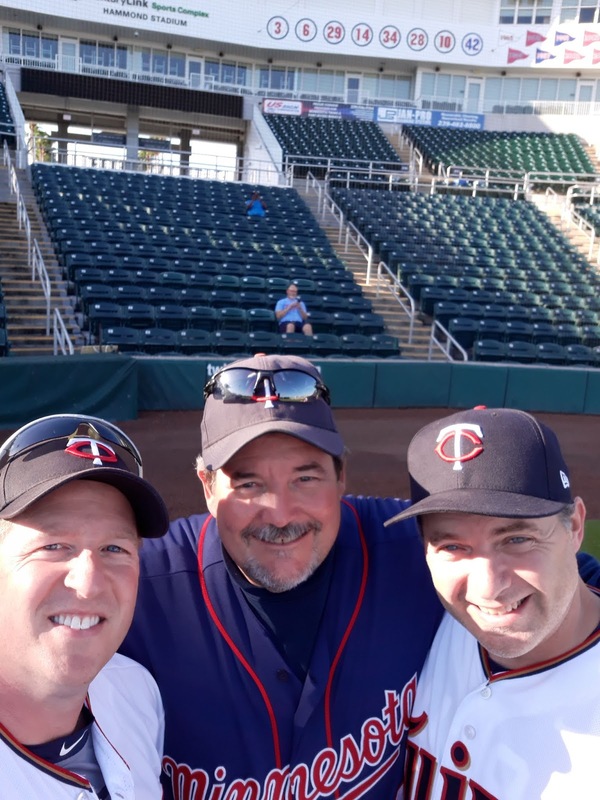 The game was good -- I ended up hitting well 2 for 3 and pitching all 7 innings, scattering 5 hits, giving up 1 run (unearned) but ZERO walks and ended up with 7 strikeouts. I threw 90 pitches with 63 of them strikes - with the help of a nice strike zone by Mr. Ump. I will give a shoutout to my MVP Rightfielder Abby - she caught two fly balls out there today and both were big outs - the wind was blowing fiercely in from right field - so for her to track those flyballs was a big help and my SS/3B combo played very well as I was able to get a fair amount of ground balls to the left side. My man Mark got an important hit as a part of a rally in the 5th inning - so a great game all around by basically the entire lineup. Camp MVP Ryan Hess was a big part of the week along with his best friend Dave Prybilla, who basically smothered everything in the field and made a great play in the first inning by tagging out a runner who was wondering off of 2nd base to get us a huge out early in the game. I found the booth about the 2nd inning and stayed in there until the 5th inning and if Nick will have me again in the future -- would love to visit again and hone those skills. In High school I did have dreams of being a broadcaster -- but I will be honest, I mumble a bit and my voice (IMO) is not a great broadcaster tone -- but I listened to it and I will give myself a solid B for my first time. The games are features on the Walshmedia.Net website -- or simply search for them by typing Twins Fantasy Camp. 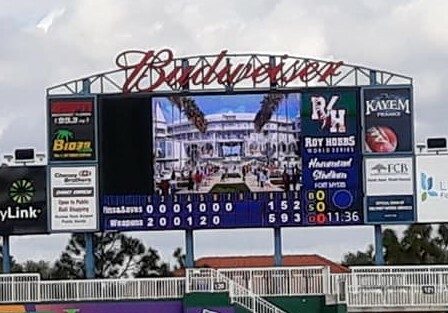 The camp plays two games on Saturday in beautiful Hammond Stadium here in Fort Myers -- the Red Division game and the Blue Division (names of colors instead of "Upper" vs "Lower") -- all four teams that won on friday were squared off for Saturday. 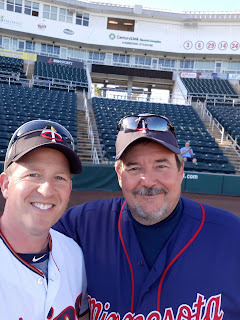 We played the Wins & Saves team led by Frank Viola and Jeff Reardon -- I played for them last year and had a great week. 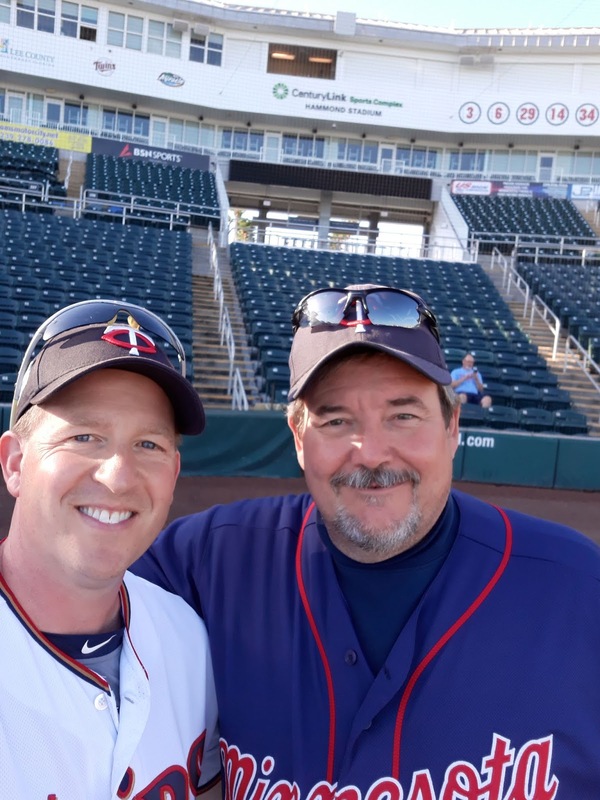 I was pitching on the mound and got things going in fine fashion by getting out of the first inning by striking out "the cleanup" (and one of the best hitters in camp) hitter and we end up scoring 2 runs in the bottom of the first. We hold on to that lead through three innings -- they end getting an unearned run in the top of the 4th and we matched them by getting one in the bottom -- so Top of the 5th is here and it is now 3-1 -- I am facing the top end of the lineup and can get through this I should be ok. The leadoff batter gets a single and things are going -- but for some reason on the next pitch he tried to steal 2nd - but the ball stayed on the dirt (you can advance bases when the ball near home plate finds some grass) - a well placed umpire kept the ball from scooting away - well instead of being patience and advancing to 2nd - the runner went - and he ended up being out since he was not able to advance - part of the strange rules at camp and/or strange plays - that was a big break for us - the next batter gets on by an error -- but I strike out the next batter with a great changeup for 2 outs -- I get the next batter to ground out and the inning is over. We end up adding 2 runs in the bot of the 5th inning for a 5-1 lead -- I now have 8 remaining hitters to get the final 6 outs. The top of the sixth is a good one, gave up one hit, but got 3 outs in 4 batters -- we get to the 7th inning, I struck out the first guy, the next guy grounds out to 3B, the next batter hits a weak grounder to 2nd, the 2nd basement flips the throws, its low and the firstbaseman couldn't hold on -- ugh.....sometimes fantasy camp is tough. I end up striking out the last guy and the Weapons of Destruction wins the game. The afternoon game was good -- #1 undefeated Warriors vs. #2 Shake It Up -- Warriors won the game 4-3 by taking advantage of all the hits and walks they -- Shake it Up had 11 hits but could only muster up 3 runs - they left a lot of runners and had a 1-0, 2-1 lead early on. Randy Lott (odds on camp MVP) closed the game out for them. Warriors finish the week undefeated -- I think that is the first time I had witnessed that. A great week -- the best part is I feel in good shape other than some sore legs. Will post some pictures later -- off to the banquet as they hand out the Hardware (MVP, Cy Young, etc) and say our goodbyes. An early flight home tomorrow means an early night to bed. Just a quick post about friday's games -- it was an interesting day indeed. The weather was great today for baseball -- it alittle chilly to start but warmed up nicely by 10am when first pitch arrived. We scored an early run in the 1st to take a 1-0 lead - we had Hess on the mound and his first inning was flawless. The 2nd inning got a little interesting as they loaded the bases with zero outs -- he worked out that major jam by getting a couple strike outs (thank you umpire with a huge a strike zone) and we head to the bot of 5th with the same score -- we get 2 more that inning and stake out to a 3-0 lead. Top of the 6th -- they get bases loaded and 2 outs -- the big lumberjack comes up to the plate -- Hess makes a great pitch to induce a weak popout to the 2nd baseman and we head to the 7th where Hess took care of business and finished out the win -- 3-0 victory for the Weapons of Destruction over the 3 Amigos. In other action -- 2 of the other games were fantastic -- Warriors were down 3-0 going into the 6th inning against the Ditch Cougars and tied it up at 3-3, the game continues into extra innings -- in the bot of the 8th a walk off bases loaded single ended the game 4-3 -- wow! Shakers beats the Oreo's 9-4 in the other "top" division game -- Wins & Saves advances with a 5-2 victory over the Ball Barians. I will get the call on the mound tomorrow and this will be a good time and look forward to the challenge of the big game. We play two on thursday to finish out the pool play of camp - teams are getting into seeds for the final push to the championships. Our games were really ugly today - errors highlighted our defensive efforts (I even dropped a pop up for my 1st fielding error of camp) -- we lost our first game 10-8, and in come from behind fashion, we won in a walk off 2 RBI base hit from our stud Dale for a 10-9 victory -- a strange day indeed. We finish the camp 3-4 and get the 5 seed. So as the 5 seed, we will play the 8 seed -- which we played this afternoon and barely beat them - so we need to play a good game to be able to play on Saturday - not a gimme despite them only winning 1 game so far. So we will look forward to Semi Final Friday at camp! Once in a while this blog takes a hard right turn (see article about Steve Lufkin) but this year our family had a game changing event this summer (well a few events – maybe not game changers) – but in June my wife decided we were going to do some daycare for a 21 month old little girl – her dad (single dad named Tim) was in between trying to find child care for his daughter (her name is Grace). 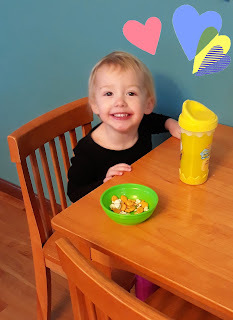 We agreed to watch her for a few weeks until his child care situation was situated – in the mean time we all fell in love. 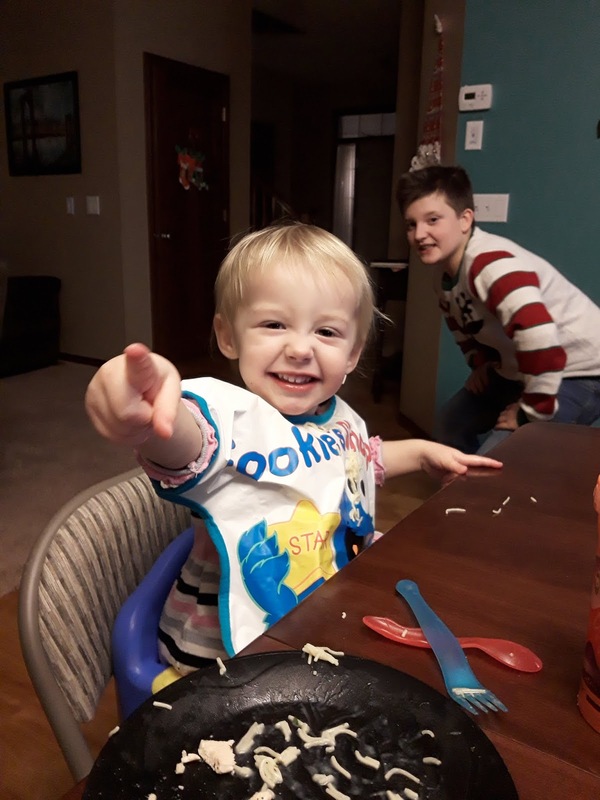 My two sons, my wife and myself – we all have enjoyed having her around and helping out with giving her dad the peace of mind when he is working or needing someone to watch her. I have always liked kids – I am blessed with so many nieces and nephews and have enjoyed spending time with them (mostly before they grew up!!) and with the busy schedules my uncle time is not where I would prefer it to be – but this little 2 year old sweetie has stolen my heart. I am blessed and thankful for her presence in my life and love how she has transformed our family in different ways. I generally pick her up at daycare every Weds after I am done with work and watch her for a few hours while her dad attends a weekly meeting – most weeks my sons and wife attend church services – so I get to be with her by myself for at least 2 hours – we have a lot of fun playing with toys, playing songs by telling Alexa what to play (Grace is so close to being able to instruct the crazy robot by herself), and reading a few books (we need to do more of this!). The days the whole family is around, the boys help out by playing with her (sometimes she only wants to play with them) - which is great. I grew up with a single mom situation in subsidized apartment living and really feel a connection to both of them. I am lucky to have both Tim and Grace in my family's life. I think my reason for this post is to make aware to those who may be reading is to step out of your comfort zone and lend a hand to someone who may need it – the blessings alone are worth it. It's Weds and I miss seeing her and look forward to being home and hanging out with Grace next Weds. I always miss my family during this week, but this year my family got a little bigger. Boy this many people find me amusing? No copyright - this more like a rube rant. Awesome Inc. theme. Theme images by spxChrome. Powered by Blogger.